As a child he moved to Turkestan with his parents from Nagorny Karabakh. While at school he developed a passion for painting which led him to the Tashkent school of art (1918-1921). 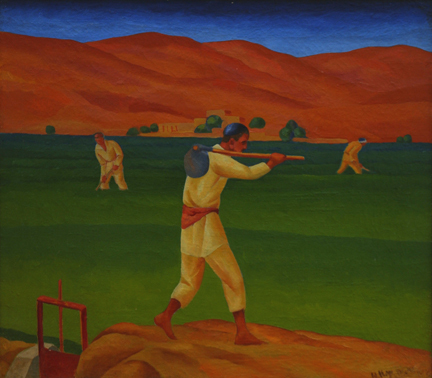 In 1921, he was enlisted in the Red Army where he spent most of his time painting. 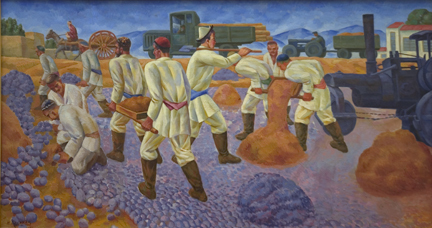 Once demobilized, Karakhan taught painting first at the Turkmen Vocational Pedagogical School (1925-1934), then at the Tashkent School of Art (1934-1941). Many of his pictures and sketches present somewhat unusual chronicle of the young artist’s development in Uzbekistan. Bright conventionalized pictures, rhythmical composition and ornamentality are distinctive features of Karakhan’s earlier works.